On Monday night American Apparel sent out an email blast promoting their 20% off "in case you're bored during the storm" sale to nine of the states effected by Sandy. 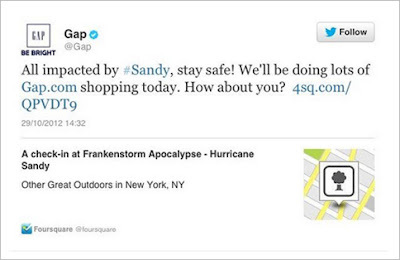 Gap also did something tacky, by tweeting to stay safe and do some shopping at gap.com. Both Gap and American Apparel received a backlash of tweets but only Gap tried to save themselves by tweeting a semi-apologetic tweet. 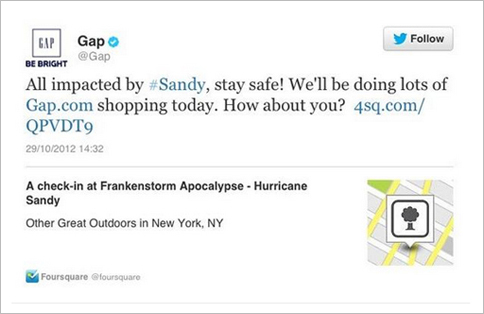 Oh boy... lesson learned to any other retail company that tries to throw a sale during a disastrous storm again. You'll fail... you'll fail shamefully. 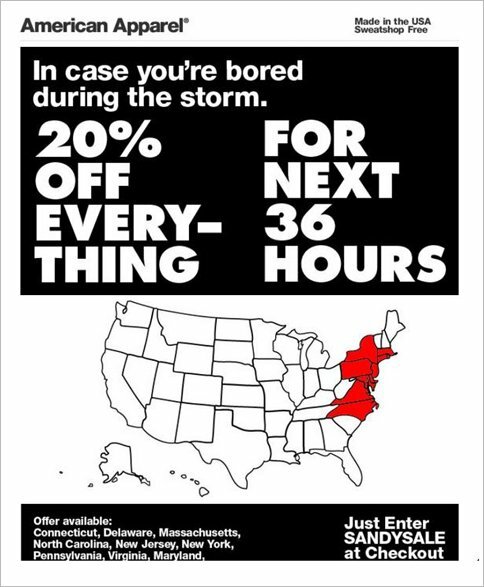 Sure, it's a little gauche, but as one of the people in the states not heavily impacted by the storm I definitely would have taken advantage of this sale had I known about it. Quite frankly, I was doing a lot of internet surfing, reading, and cleaning... why not some shopping. 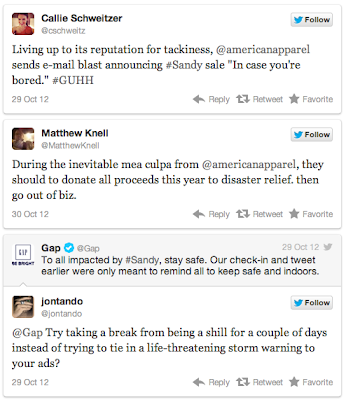 Perhaps to offset the message, they could have also promised to donate clothing to people who have been heavily impacted. That would be VERY cool.